If you have been wondering do dogs get acid reflux, the answer is yes. Just like humans can have acid reflux, dogs too can experience acid reflux, and it can be painful for them as well. The bigger issue is that as humans, we know what we are experiencing and how to eliminate the problem. For most dog owners, they might never even think that acid reflux is the problem that their dog is experiencing. Acid reflux is somewhat common in dogs of any age, but can happen with puppies more frequently as their body is still developing. I am going to discuss what can cause acid reflux in dogs, what acid reflux symptoms you can watch for with your dog and ways to help prevent acid reflux in your dog. Acid reflux is when there is an uncontrollable reverse flow of gastric or intestinal fluids going into the esophagus which is the tube that connects the throat and the stomach. This can occur from a weak or damaged sphincter muscle in the lower esophagus. The stomach is protected from these acids, but the lining of the esophagus is much thinner and the acids will cause discomfort, irritation and pain in the esophagus. Severe cases can lead to ulcers in the esophagus. 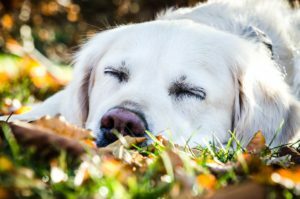 There can be several reasons why your dog is experiencing acid reflux. 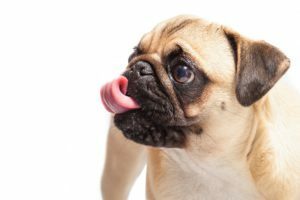 It is important for you to try to figure out what is causing your dog to have acid reflux so you will be able to work on the best plan for your dog to eliminate it or at least reduce how often your dog has problems. A poor diet or eating inappropriate food. Food that is high in fat or spicy human food both can contribute to acid reflux. Obesity. If your dog is overweight, they are in more danger of experiencing acid reflux. Excessive production of acid in the stomach. The stomach is very full. Hiatal hernia. This is a congenital condition developed from birth. It is a protrusion of the abdominal contents into the chest cavity through the esophageal hiatus, a natural opening through the diaphragm. This condition would need to be repaired by a veterinarian. High blood calcium. This can be tested at your veterinarian office. Caused if your dog has been administered anesthesia. Either from failure to fast your dog properly prior to anesthesia or from improper positioning of your dog during anesthesia. It can cause the esophageal sphincter to relax, which leaves an opening between the stomach and the esophagus. There are many symptoms that your dog could be showing you that they have a problem with acid reflux. If your dog has acid reflux, you will be familiar with many of these symptoms. Signs of pain when swallowing. Whining or howling while swallowing. Gulping or lip licking. They might be swallowing and licking over and over. Self soothing by licking weird stuff like the carpet or furniture continually. Severe cases can produce a fever. Regurgitating of fluid, mucus, undigested food or spitting up. Regurgitating is different from vomiting. Usually you will be given a bit of a warning if your dog needs to vomit. With regurgitating it is spontaneous. It will suddenly come up with no warning. Fluid will fly out without warning. This one is dangerous because it can cause vomit to enter the dog’s lungs that can lead to further damage. Like I mentioned earlier, it is important to try to figure out what is causing acid reflux for your dog. There are many things you can do on your own to help your dog, but it is also important to speak with your veterinarian about your concerns. If your dog currently is eating foods that are high in fat, you will want to remove those from your dog’s diet. Also, many times acid reflux can be caused by your dog’s food sensitivities. Dog’s tend to have many allergies and it is important that you provide dog food that reduces the chance of allergies. If you want more information on dog food allergies, please read the linked article. You can also do a NutriScan Saliva Test. It will help you to pinpoint your dog’s food sensitivities. You will learn your dog’s food intolerance and that will help you to customize their diet. This test is very simply to do, but it will cost around $300 unless you have pet insurance, which will pick up most of the cost. Eliminating all preservatives, colorings and additives from your dog’s diet. Giving your dog moist dog food. Dry dog food can induce acid reflux. Adding a cup of water to the food can help for them to with easier digestion. 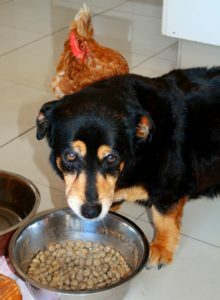 You can also give your dog food like boiled chicken which is easy for them to digest. Some cases your veterinarian might prescribe Pro-Kenetic medication. It helps to move food through the digestive system and strengthens the esophageal sphincter muscles. Rarely will surgery be required. Provide smaller feedings for your dog. Give them 3-4 small feedings instead of 1 or 2 large feedings. This will help them be able to better digest their food. Give your dog Pepcid. You can safely give your dog .25 to 0.5 mg per pound every 12-24 hours. Give it without food. The food will decrease its effectiveness. Try giving your dog probiotics. There are many good probiotics that are made for dogs. It will aid in digestion and prohibits harmful bacteria growth. Here are two that I recommend. If you have every experienced acid reflux, you know just how painful it can be. You now know that dogs can get acid reflux as well. 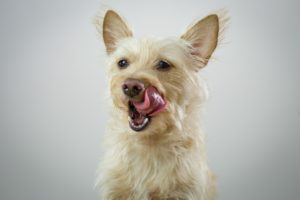 You also know what dog acid reflux symptoms to watch for, and ways to help give your dog some relief from acid reflux. If you are unable to figure out the reason for their acid reflux or unable to give them relief, please talk with your veterinarian. They will be your best source for getting to the root of the problem. From prior experience with acid reflux in dogs, I do know that Pepcid has greatly helped my dog, but you don’t want this to be a daily fix. It is best used periodically. I also recommend getting something into your dog’s stomach right away in the morning even if it is just a small milk bone. This will help with the acids. If you have any questions or comments, please leave them below. Share any methods that have worked for your dog with acid reflux. 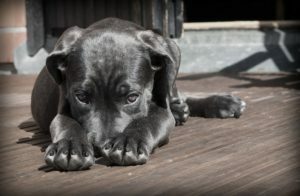 You can follow justforyourdog.com on Pinterest, FaceBook and Twitter. Some of the links within this post are affiliate links, of which I might receive a small compensation from sales of certain items.